Florian Joos first outdoor race of the season proved to be a tough one, as we decided to participate at the ToniSport Onroad Series (TOS) in Germany. The track was located in Düren, in the western part of the country and on the old premises of the Belgian Army. This made it almost a race at home soil for us. The TOS are a series of 6 races followed by a yearly final. 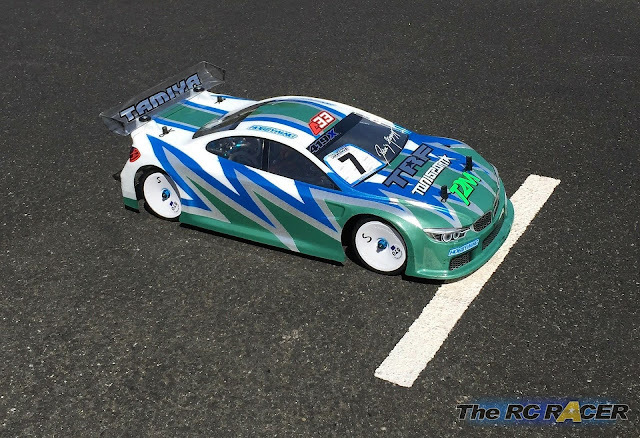 The racing series are very popular and always offer highly competitive races. 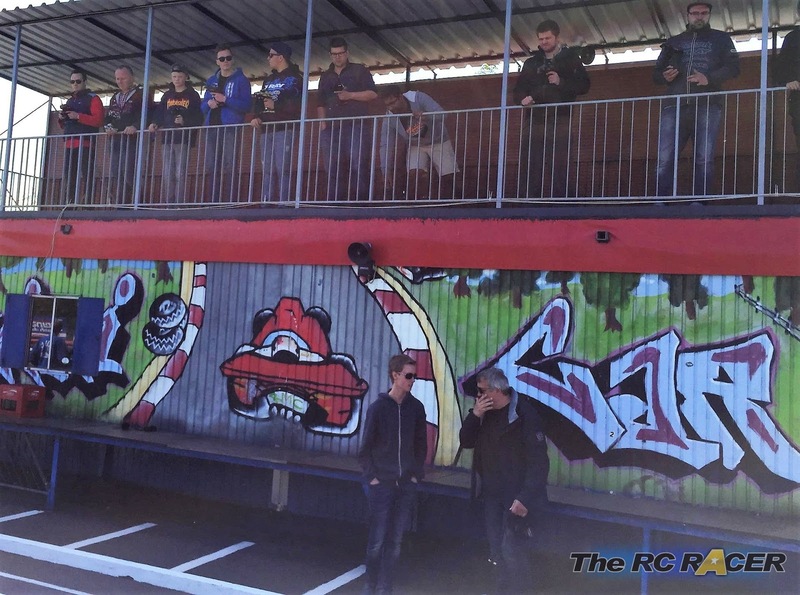 Before the TOS started, there were virtually no races for the modified class anymore in western Germany, so everyone is really eager to participate. Saturday morning was reserved for 9 timed practices in different heats. The best 3 consecutive laps would be used to reseed the groups for the 4 rounds of qualifying on Sunday. Florian participated in both the modified and stock classes with his TRF419X’s. 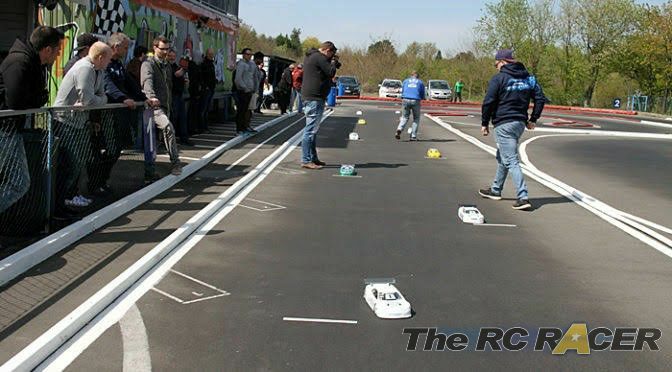 He was up to some great competitors as both in stock (Jan Rettke, Markus Kreder, Dennis Kalinowski, Sandro Speck, Majuran Tharmalingam and Domenic Paul ) and modified (Yannic Prümper, Marc Fischer, Thimo Weissbauer) there were some very fast ETS A, B and C finalists going to race as well. The track in Düren is 238 meters long with a 60m straight and a technical infield with some 180° corners. The first practice started in low grip conditions, so it weren’t the best circumstances for Florian to learn the track. His car was basically the same as during the last carpet race. I only put a Mazda6 shell on and used a 5000k diff. His first practice didn’t go too well as the car was extremely loose under acceleration. His best consecutive 3 laptime was almost 59 seconds and more than 4 seconds off the pace of the front runner. Because the track had many of those 180° corners, I decided to put 3.0 degrees of rear toe-in on his car (he normally runs 1.5~2°), so it was a drastic departure from his setup. In order to compensate the increased rear end grip I also mounted the Protoform LTCR body. His car was much better and his lap times were down to 55.9. For practice 3 I used a softer rear diff to give him a bit more traction out of the corner and slightly more turn-in. This made the car better again and he was down to 54.8. Before practice 4 I mounted a split upper carbon deck to make the car flex a bit more. I also put the Bittydesign M410 shell on (mounted 6mm forward) to give him a bit more turn-in. This again helped and the laptimes were down to 54.2. Practice 5 and only a minor change. As Florian was getting faster and faster I put a fresher (4 runs) set of tyres on to see how his car would perform on fresher rubber. Lap times were down to 54.1. Florian was now in control and wanted more turn in. So, in practice 6 I reduced his rear toe-in to 2.5° (D block in the back) and his car was getting better and better. Times were now down to 53.6 and 17.689 for his fastest lap. Markus Kreder did a 17.551 so Florian was happy with the progress. Overall he now was in P9 out of 24, so our work really paid off. In practice 7 he hit a kerb too hard and broke a C-hub so he couldn’t improve his time. We didn’t participate in heat 8 and 9 as we went home. Some drivers used a new set of tyres for the last reseeding and Florian was overall 11th fastest. This meant he had to start in P2 of the second fastest group. At the TOS you are allowed to use 2 sets of tyres for the race weekend. For Q1 I mounted a set of fresh tyres (last years Volante 36). Because he would have more overall grip I made the last tweak of the weekend to his car and put the rear dampers in position 3 instead of 2. This makes the car steer a lit sharper. Florian had a very good qualifier, and he was fighting for the win with Federico Veronesi and Mario Wittemeier in his heat. These guys were running neck and toe for 5 minutes. Florian was leading the race but slightly touched a kerb. He lost .2 of a second on that lap and finished in 3rd position of his heat and 8th overall. Racing is pretty tight in Germany! For Q2 I used a newer battery and left his setup unchanged. Florian was on a stormer of a qualifier and took P3 overall. He recorded the second fastest single laptime, so he really was competitive. Q3 went well, but he again was on an enormous pressure as Mario and Federico were going for the win. In the end, Florian finished in P2 of this heat. The top 3 were again only covered by .2 of a second. In Q4 we used his good battery from Q2 again and he was again on fire. I made a big tactical error by not putting him on new tyres. Most of the drivers in the faster heat used new tyres and Floran only had a P8 overall, despite setting his personal fastest time of the day, 2 seconds faster than on his new tyres! Florian was in P7 overall, which, considering the fierce competition was a great result. If I would have put him on new tyres for Q4 he could have scored a bit better. 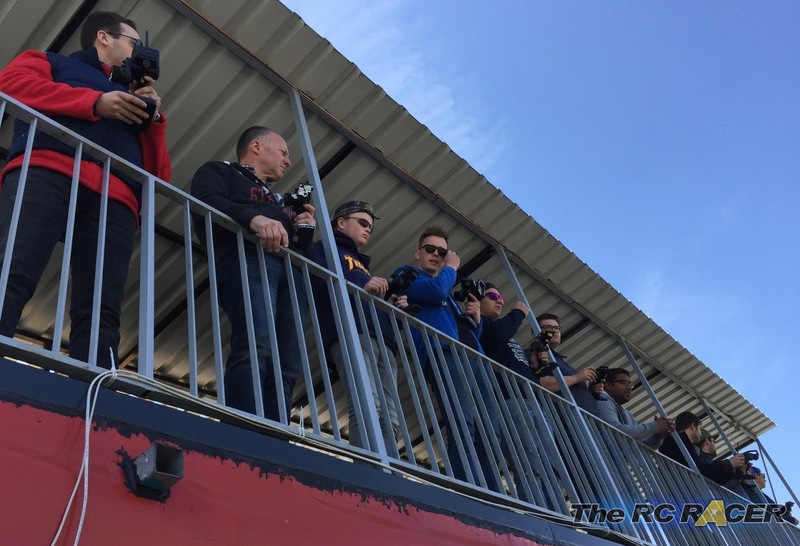 The A finals were going to be contested by 11 drivers. Before the start there was a drivers presentation and no warm-up laps were allowed. Florian was taken by surprise when the start signal sounded, ran a bit wide in turn 1 and found himself in P10 after 1 lap. The race for P2 was very exciting between Jan Rettke, Sandro Speck and Majuran Tharmalingam was very exciting to watch. When Florian made an error and crashed out of the race this happened unnoticed by the track marshall. When he was marshaled he came into the pits to save his tyres. A2 went a bit better. Florian retained his position at the start, but got hit at lap 5, which left him defenceless for the rest of the race. He managed to put in the second fastest lap time, so this was a small consolation. Florian had two bad results, so he had to score a good result in A3. He made a good start, made some great moves and made the tactical decision to let a faster driver go by. Het got P4 in the last final,n which really was the result he hoped for! Florian really loves modified, but it puts a huge stress on the mechanic as everything needs to be spot-on. To be honest, servicing two cars in 1 hour time isn’t so easy, so I neglected his modified a bit. I should have changed the belts and pinions, but lack of time kept me from doing it. His basic car setup was again almost the same as the one from the last indoor race. I only put turbo timing on the Hobbywing XR10 Pro speedo, changed his brake settings and put a 30 tooth pinion on the motor (Hobbywing 4.5). When I saw that Florian had traction problems with his stock, I put 3.5 degrees of rear toe-in on his car (Block F). I put a pair of used Volante 36 tyres on and he was ready to go. Again Florian had to learn the track. Those modified cars were sooo fast down the straight. I think some of them easily exceeded 100km/h. the brake points were very important and Florian gradually got faster. His first consecutive 3 laptimes was 52.5. Before run 2, I reduced his rear-toe in to 3 degrees again as Florian said he had too much understeer. His car was faster and his times tumbled down to 48.2 seconds. His car was however too tricky to drive, so I put the F block on again. For the third run, I mounted a fresher set of tyres Florian received from Jilles Groskamp (thx again JillesJ ) and his times tumbled down to 47.3 seconds. He now felt his car was great and told me to leave it as it was. 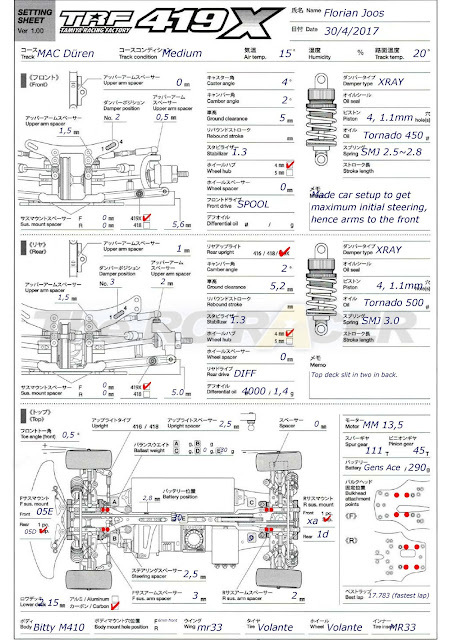 I still noticed it lacked a bit of rear grip, so I used a softer rear spring (SMJ 2.8 – Blue) but put his shocks more upright in hole 3 in order not to loose too much steering. Florian recorded a 46.7 and a single fastest laptime of 15.462. For Q1 we left his car unchanged from the previous day, but put it on new tyres. His qualifier went great and he got a P4, behind Yannic, Marc and Thimo. Q2 went even better, but unfortunately Marc and Thimo ran into problems so Florian got a nice P2. He was able to get a P3 in Q3, which earned him a P4 spot on the grid behind Yannic, Marc and Thimo. In A1 Florian got a P3 behind Yannic and Marc. I put a new set of tyres on, but he felt they weren’t on par to the ones he used the previous day (he used Volantes from last year’s batch), but we just decided to keep using them and not revert to the qualifying set. 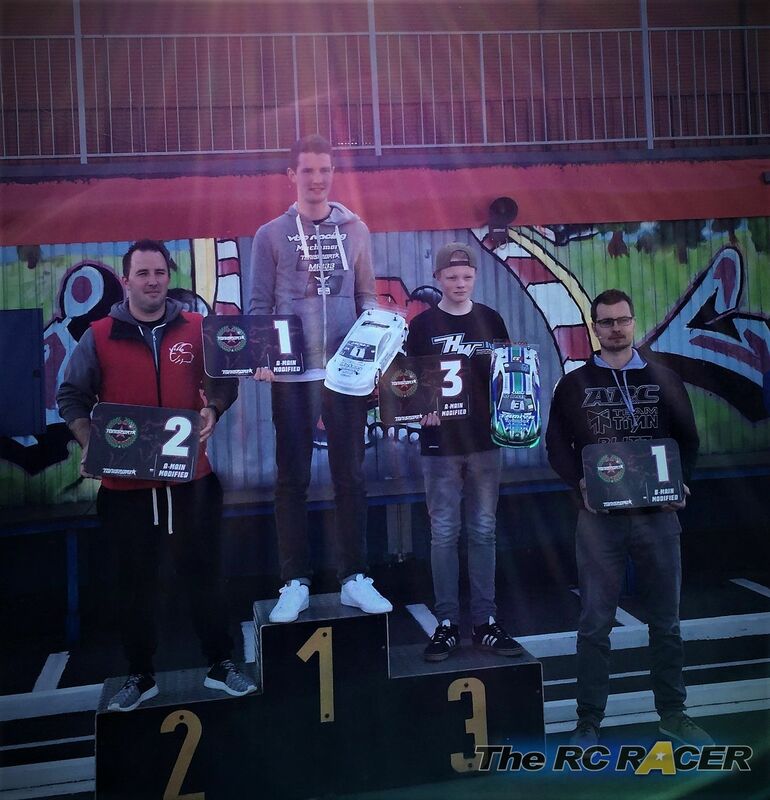 The highlight of his race came in A2 when he had a big scrap with Thimo and Daniel Bratzler. Florian managed to keep the door shut, but after 5 laps of pressure traction rolled and lost position. 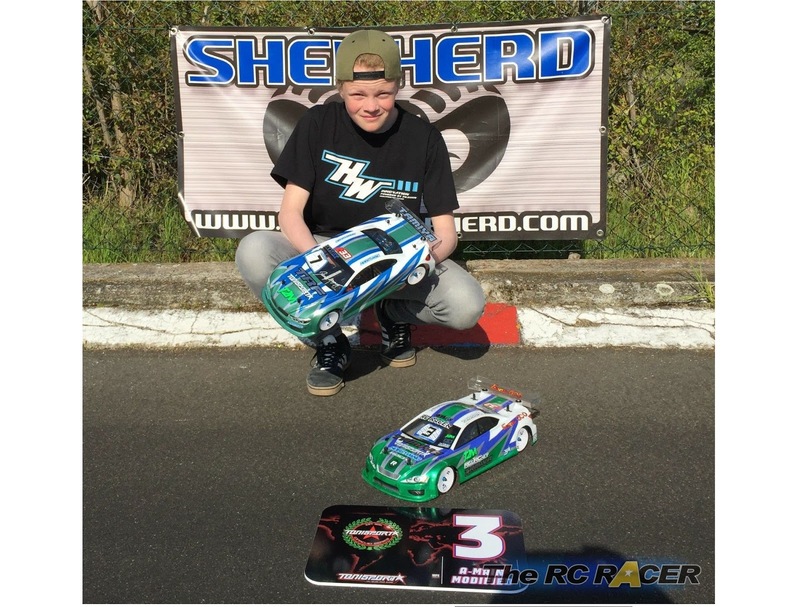 In A3 he got a P2 after an intense fight with Andreas Weyhoven. This result earned him P3 overall. Florian and myself were really pleased with this result, especially as Florian started occasionally racing modified just one year ago. I see that a lot of people are using xray front ends. Think you could make a guide on doing the conversion? Florian just used the shocks as he had a set and they are pretty much interchangeable with the kit 419x ones. The rest of the car is Tamiya. F with a solid E block at the front is a similar setup to X-ray runners. Swapping the arms etc is not worth it. A friend recently tried it as he was a X-ray driver before TRF and had spares. He didn't like the extra slop of the 419 hubs (don't we all) so he just pretty much bolted on the Xray front end. The issue is that the geometry is then all over the shop and the steering feel going into the corners was terrible. He was slower as he found the car harder to lean on. He moved back to the TRF parts and they have remained since. I will see if he has any photos of his conversion but I personally don't see the point. I would just try the F/E combo at the front as that does give you lots of steering. Btw, if you have any other info let me know. I haven't seen any other TRF runners do this conversion. 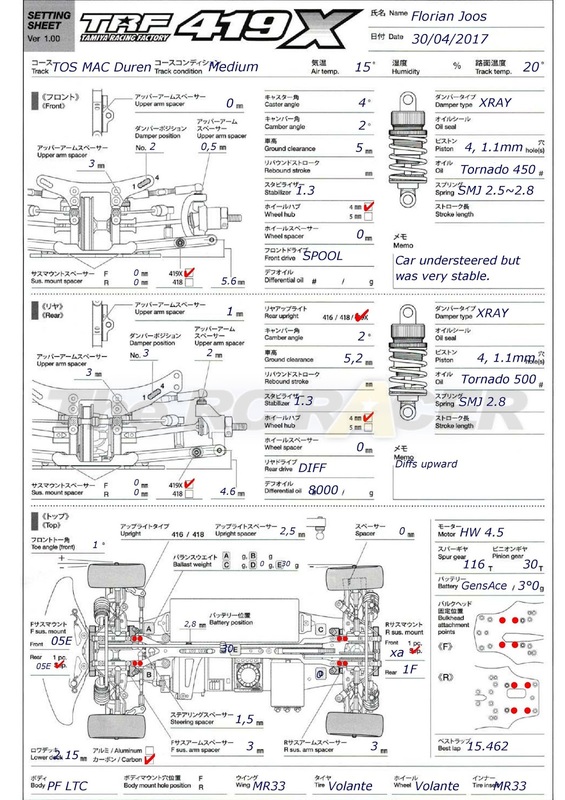 I understand that some people don't like the SS big bore shocks from Tamiya since they tend to leak. If I have the choice between the Axon High Big Bores and the Xray shocks, which would you suggest? BTW, The people I see running the conversion aren't necessarily high profile racers. The TRF419 thread on RCTech has some people mentioning it recently. The Tamiya ones are ok. I use the clear o-rings and the hard rod guides and they work well with no leaks. I am very tempted to get the Axon shocks for the 419x I have heard great things about them and I need a spare set for trackside. I use a lot of axon components and they are exceptional quality so I do expect them to be good. As to the X-ray front end, I would not bother. 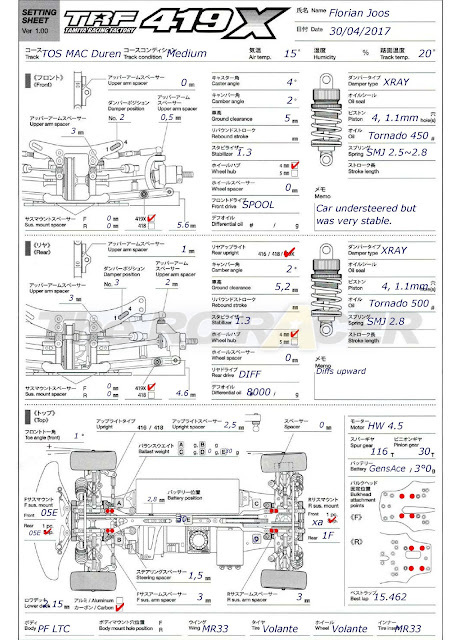 Nice, I think I will stick with the tamiya dampers then. Thank you for your reply! Love the site, keep up the good work.